In March of 2006, a group of people with the Humane Society of the United States, two which included Heather Mills and Paul McCartney, join the team, Ice to Protect Seals where they congregate along the Gulf of St. Lawrence before the hunt. Many people did not pay much attention to the brutal slaughter of the seals, mainly baby Harp Seals, until the last few decades. Since then, people have joined forces with the Humane Society of the United States, two of which are celebrities, Paul McCartney and Heather Mills, to try and stop the unnecessary killings and protect these cute animals. A group under the name of Ice to Protect Seals made their way to the cold icy shores of the Gulf of St. Lawrence in March, 2006 to explore the area and observe these animals in their natural environment before the hunt started. The Harp Seal pups are in extreme danger and when celebrities like Paul McCartney and Heather Mills join these groups to try and save these animals, the public seems to become more aware of the problem. 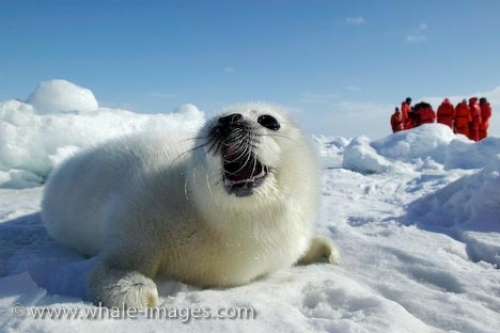 Photo of a baby seal and a group with the Humane Society named "Ice to Protect Seals" along the Gulf of St. Lawrence. This seal hunt is the largest throughout Canada with the numbers in 2009 allowing 280,000 seals to be hunted, 5,000 more than the previous year. The hunt for 2009 began on March 23rd and close to 10,000 of these harp seals off the Gulf of St. Lawrence have been killed within two days. Many of these baby Harp Seals have not even learned how to fend for themselves and the brutality humans show in slaughtering them is unacceptable in today's world. The Humane Society of the United States has witnessed many scenes of unbelievable cruelty and continues to cover the savage beatings of these animals in hopes that this will come to an end. More witnesses which see how these people with hakapiks, knives and guns kill these innocent creatures and with pictures being shown across the world, the better the chances become of saving the seals before they become extinct. The Canadian government needs to step up and put a stop to the seal hunt like many other international locations. The Harp Seals are killed for their fur which has dropped considerably in price, making these slaughterings a cheap thrill not a way to make a living. A baby Harp Seal, still blanketed with his soft, white coat of fur lays on the frozen landscape crying out for the return of its mother who comes back regularly to nurse her young. The scent of her pup is all the mother needs to remember and she will only allow her own baby to nurse. These days of waiting for the return of its mother will quickly end after about 12 days when the pup is left to fend for itself on the ice floes. When the Harp Seal is about 3 1/2 weeks old, it can swim and feed on its own unless it is killed by humans who have no concern for these pups and find the seal hunt a thrilling experience. Protecting and showing the world how beautiful and important these Harp Seals are has become a number one concern for the members of the Humane Society of the United States. Witnessing these killings is painful to watch for groups like Ice to Protect Seals but one of the best ways to reach people to help protect them in the future.